It's well documented that Sarah Palin has problems with Democrats and independents, but the first seven states where we've looked at the 2012 Presidential election make it clear that she has a Republican problem as well. It's not that Republicans don't like her- on our last national poll 68% rated her favorably, making her easily the most popular prospective 2012 candidate with Mike Huckabee at 63%, Newt Gingrich at 57%, and Mitt Romney at 56%. It's that a lot of the Republicans who don't like her- in contrast to the Republicans who don't like Huckabee, Gingrich, or Romney- aren't willing to hold their nose and vote for her in the general election. 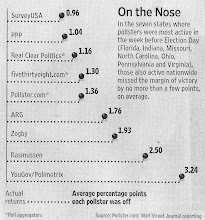 Across the 7 individual states where we've done 2012 polls so far- Michigan, Minnesota, Missouri, Massachusetts, North Carolina, Montana, and Virginia- Palin averages receiving 77% of the Republican vote against Barack Obama. That puts her slightly behind Gingrich at 80% and well behind Romney and Huckabee at 84%. Palin does the worst of the Republicans among Republicans in Montana, Missouri, Massachusetts, Michigan, and Minnesota. Only North Carolina where she does better than Romney and Virginia where she does better than Gingrich and Romney serve as exceptions to the rule. As a 20 year old who interacts with many Republicans between the ages of 18 & 30, I can tell you that Sarah Palin is extremely unpopular in this group. I wouldn't say she is viewed as too liberal or too conservative by this group, but just as a bad candidate who isn't intelligent or politically astute enough to be president. Many have told me that if Palin is the nominee, they will not vote for her, so these numbers are no surprise. Bottom line: Republicans like Palin, don't want her as president. If you're on the right and say anything negative about Palin you'll get blasted. Most Republicans like Palin, if for no other reason that Democrats hate her so much. Now that I think about it, that's what I like best about her. I don't know if you have the data, but I'd bet that the defectors are heavier among upper income Republicans. These are all the same things said about Ronald Reagan, particularly that he had no foreign policy acumen or auctoritas. And look what happened... he defeated the USSR without firing a shot. The key to getting our nation's economy back on track is becoming energy independent. The key to keeping America safe is becoming energy independent. Because of Sarah Palin's experience, knowledge and views on domestic energy, the USA needs her to become President. I am a Republican and I love Sarah but I'm still not sure I'd vote for her in a primary--maybe. I know dozens and dozens of older people, 65+, in my community who will not vote for her in a primary. However, ALL of these people will absolutely vote for her if she were to win the nomination. This age group doesn't really want Palin as President but they sure would rather have her over Obama. If Palin can get this age bracket in the general election, she'll win. Your own numbers show that Palin wins around the same percentage of Democrats against Obama as the percentage of Republicans that Obama wins against her. They both win around 9% of the other party against each other in the six states you have polled (Massachusetts Republicans are inflating the numbers for Obama while North Carolina Democrats are inflating the numbers for Palin). Kerry won 6% of Republicans against Bush and Obama won 10% against McCain. If you take out the Massachusetts number, she's only losing 7.6% to Obama. Republicans may hate Jimmy Carter but there look to be a pretty meaningful percentage of them who don't hate him enough to vote to put Ronald Reagan in the White House. When you combine that with his complete lack of appeal to Democrats and independents he looks virtually unelectable for 1980. Palin is exactly what this country needs right now and the RINOs who do nothing but repeat the left wing talking points about her are one step above the obamabot crowd. She cut the heads off of corrupt republicans in AK, earning herself the hatred of both political party establishments and a 90% approval rating from the people. She sold the private jet, fired the private chef and refused the governor's car. There is a reason why the establishment fat cats in washington don't want her anywhere near their town. She is an outsider and a REAL reformer. She outdebated a 35 year sitting senator for 90 minutes when she was just a 2 year governor, in front of 70 million people. She will have the chicago machine marxist stuttering his infamous "uuhh uuuhh"s in the first 5 minutes of a presidential debate. Envisioning liberals' heads exploding as she is sworn in makes me smile from ear to ear. I was born and raised in large a Michigan county which probably swings at least 2/3 Republican in any election. My extended family is fairly large; uncles, aunts and cousins almost uniformly Republican, almost uniformly "conservative Christians." They are really embarrassed by Sarah Palin. My informal polling resulted in not one positive comment about Ms. Wasilla. I wasn't surprised, but I was very, very pleased -- and relieved. Bottom line is: They want to bone her but they don't want to marry her. I'm in Ohio. Although there are Republicans and Indies who would not vote for Sarah as their first choice for GOP primary, they all (30+) said that between Sarah and Obama, they would vote for Sarah. Ohio has really suffered for four years under Dem control, losing over 400,000 jobs, and the Indies have left Obama in huge numbers similar to Virginia. I believe that if Sarah runs and wins the GOP Primary, she will reach out to unite the different anti-Obama factions including GOP, TPM, MamaGrizzly, Indy fiscons, socons, and union Dems who are sick of their leadership as businesses leave the midwest due to unions, regulations and high taxes. People will eventually come home in the end. Sarah does not attack the other candidates. She honors Reagan's 11th Commandment. All you Republicans posting here do realize that PPP is the poster of DailyKos - both of which are arms of the DNC - and do their bidding with these polls? And if you don't believe that, believe that they're lousy pollsters; they had Doug Hoffman winning NY 23 by 20 votes. He lost. They've beeen waaaaayyyy off on other polls as well. They've also had Huckabee winning most of the state polls for the last 6 months. Yeah, right. They're more accurately called DNC Polling - because they rarely poll "public policy." What? You refer to a married mother of 5 children, one of which is a soldier who served in Iraq, as a neo-con & no better than a common prostitute? You can't debate any better than that? Crawl back under the slimy rock you slid out from under. "a 90% approval rating from the people"
If that were ever true, she sure lost that fast. She's quite unpopular in AK now. "She will have the chicago machine marxist stuttering his infamous "uuhh uuuhh"s in the first 5 minutes of a presidential debate." That's certainly not the Palin who got owned by Biden in 2008. I'm an under 30 Republican who has voted in every election in which I was eligible. Maybe it's because of my age, maybe it's becuase I'm from New England, or maybe it's because most of my family is made up of Democrats- but regardless of the reason, I consider myself a moderate. I strongly dislike Obama and think his policies are wrong for our country, but there is absolutely zero chance I would vote for Sarah Palin over Barack Obama. It isn't that she is more socially conservative than I am- which she is; I would almost certainly vote for any of the other potential names being thrown about over Obama even if I disagreed with some of their positions. While I agree with many in the GOP that Sarah has energized aspects of our party's base and that she is often treated unfairly by the media, that does not change my opinion that she lacks the intelligence and the capacity to understand sophisticated issues necessary to be the leader of the Free World. I may hate Obama, and the thought of voting for him may make me a bit queasy, but the thought of Sarah Palin in charge of the nuclear football is a proposition that is far worse to me. The GOP would be committing electoral suicide by nominating her in 2012. There are several other candidates who share many of her values and her positions that would be more electable than she is. Many of these candidates would also not cause the same negative passions that the mention of Sarah Palin's name elicits. Many in the GOP like Sarah Palin precisely because she is so hated by the left; however, what these people fail to realize is that her sucessful primary candidacy would actually be a a setback to the conservative agenda. I will do whatever it takes to vote against Sarah Palin. If you thought George Bush wasn't smart enough, Sarah Palin will make him look like a genius. This woman is unfit to have a driver's license, yet alone run for any type of office. As opposed to Rasmussen, hrh, whose polls are so skewed Republican they make Fox News look "fair and balanced"? As a strong supporter of President Obama --- I really really REALLY want Sarah Palin to win the GOP nomination. I think that Sarah Palin would energize the Democrat base. It would be like throwing gasoline on their fire. Huckabee would woo them over a lot and clobber Obama in the debates. Then, as President Huckabee, he would champion the kind of policies that will help the nation (i.e. the FairTax). As a member of the U.S. Army having spent at least 5 of 17 years away from my family for my country, I believe i'm a patriot. Mrs. Palin, do to the fact that I don't THINK like her does'nt consider me a "Real American". That is why she doesn't deserve or will ever receive my vote.